US Military Supports Ukraine’s Neo-Nazi National Guard. Are US Forces Involved in Combat Operations? The US military has announced that it is training Ukraine’s Neo-Nazi National Guard including its infamous Azov battalion, responsible for countless atrocities directed against civilians in Donbass. America’s training initiative is implemented in the context of a process of military escalation. The training program is coupled with the influx of military equipment under a program of so-called “non-lethal” military aid. The US contingent of instructors includes 290 specialists which will be working with the National Guard. Britain has dispatched 75 military personnel responsible for training “in command procedures and tactical intelligence”. (Los Angeles Times, April 20, 2015). In turn, Canada announced that it would send 200 specialists to train Ukrainians “in explosives and de-mining operations, medical aid, military police operations and logistics.” (Ibid). The fact of the matter, however, is that the Nazi National Guard militia are directly under the command of Ukraine’s military. 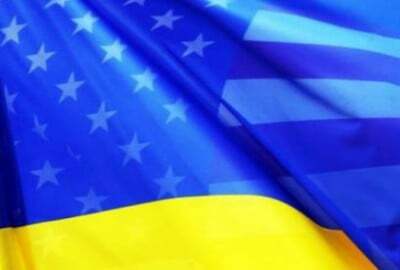 Moreover both the US and Canada are in close liaison at a diplomatic level with the leaders of the Neo-Nazi parties in Ukraine, who occupy key positions in the US sponsored Kiev regime. In February, the founder of the Social-National Party of Ukraine (SNPU) [renamed Svoboda] Andriy Paruiby was received by the Harper government and the House of Commons in Ottawa. What is unfolding is the piecemeal dispatch of US and allied special forces to Russia’s doorstep. While Western Special Forces are not (officially) involved in combat operations in Donbass, US officials are actively participating in military planning and training operations. Meanwhile, mercenary forces integrated by Academi (former Blackwater) are involved in combat operations in Donbass. 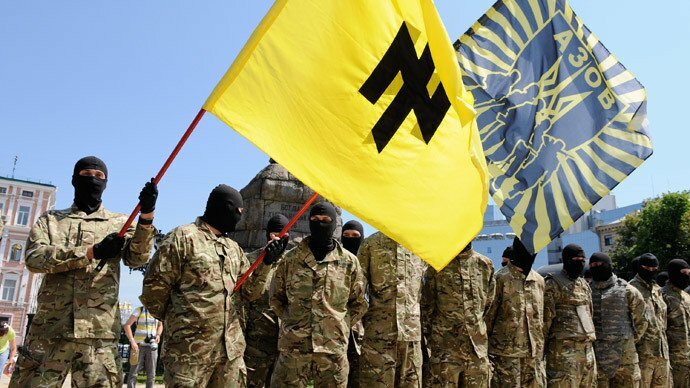 US military support to the Neo-Nazi brigades is acknowledged by the US media, The National Guard militia which operates under the Command of the Ukraine Armed Forces have Nazi insignia on their uniforms. The Nazi insignia are not limited to the Azov battalion. A joint Ukrainian-U.S. flag detail marches to position before the ceremony that marked the beginning of the U.S.-Ukrainian exercise Fearless Guardian in Yavoriv, Ukraine, Monday, April 20, 2015. U.S. and Ukrainian troops rang in the start of a new training mission here Monday, an effort to beef up the capabilities of Ukrainian forces fighting Russian-backed militants in the country’s east. The Fearless Guardian exercises are expected to run at least through the end of summer and turn out thousands of newly trained personnel to take on separatists trying to splinter off from the former Soviet republic. The first batch of about 900 trainees have already fought on the front lines of the year-old conflict, said Ukrainian President Petro Poroshenko, who addressed the U.S. and Ukrainian troops in a mid-day downpour. But the country’s armed forces, he said, need to be rebuilt. His company was also the first to deploy to Lithuania last year as part of the U.S.-led Atlantic Resolve mission to reassure Baltic and Polish allies after Russia annexed Crimea from Ukraine near the start of the conflict. Ukraine’s national guard forces have been converted from volunteer militias that sprang up less than a year ago to fight Russian-backed separatists into units under the command and control of Ukraine’s armed forces. Moscow has described the effort to train Ukrainian forces — in which Britain and Canada are also participating — as “counterproductive,” saying it will not help resolve the “fratricidal” conflict in Ukraine. Ukraine has repeatedly accused Russia of sending its troops to help and arm the separatists — a claim Moscow denies. Poroshenko said it was a Ukrainian government decision to have the guardsmen receive the U.S.-led training first, but hopes that regular army units will be able to get the training as well. The deployment is a homecoming of sorts for a handful of 173rd paratroops, who were born in or have close ties to Ukraine. Sgt. Anton Kovalchuk, who will work as an interpreter, was born and raised in a city about an hour east of the training center, which sits near the Polish border. The training kickoff drew more than 180 reporters, mostly representing Ukrainian media outlets, who swarmed the Americans for photos and video. “It’s very overwhelming,” said Staff Sgt. Ashley McLeod, who will manage training schedules and ammunition for the two months her unit runs the training.